The past month has, for me, been spent deep in the edit of Sisters For Sale, our feature-length documentary to raise awareness of human trafficking. The film focuses on the stories of my teenaged Hmong friends who were abducted from northern Vietnam and trafficked to China, where they were sold as brides to local men. With the interview footage and a placeholder narration assembled, I’ve been busy reviewing our secondary footage. It’s an exciting process, and the first time I’ve seen most of the footage since it was recorded. Some of it I have never seen at all. For over a year I’ve been visualising particular sequences, and it’s wonderful to see them coming together at last on the screen. It’s also a very long process. I’ve already trawled through some 59 hours of interviews, phonecalls and raw footage, and can’t even say exactly how much remains. There was an immense amount of material captured, with a shoot spanning a full year, and the storylines followed in the film continuing far longer than expected. I never realistically expected to contact, locate or meet with my trafficked friends M and P in China. I never expected to be so deeply involved in organising their attempted rescues. I never expected P to escape her “husband” and return alone to Vietnam, and I certainly didn’t expect the events of the past month. 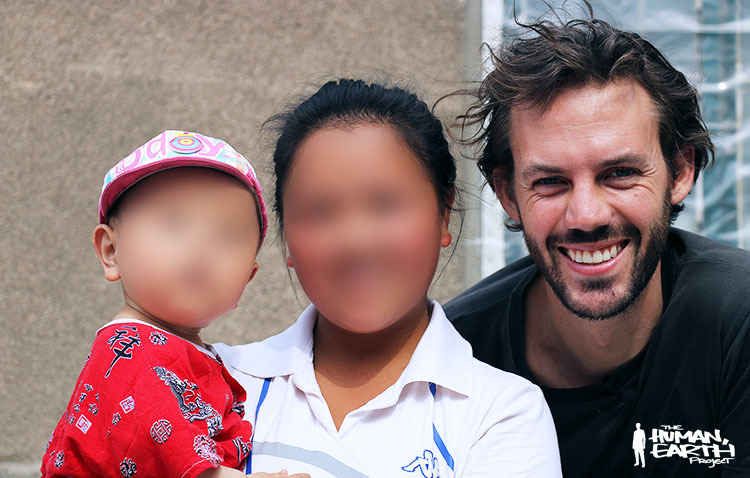 M – my only trafficked friend still remaining in China – had stayed there for the sake of her baby. Although she desperately wanted to return to Vietnam, she seemed to be awaiting the permission of her Chinese “husband” – permission I was certain she’d never receive. Last month, that permission was granted. Incredibly, not only did M’s Chinese “husband” permit her to visit her family in Vietnam, he also allowed her to take their 22-month-old baby. M and her child spent two days and nights travelling by bus towards the southern border. M’s situation in China has long been made precarious by her lack of a legitimate Chinese identification card. As a victim of human trafficking, M was clearly not a legal resident, and technically ineligible for an ID card – yet forgeries are available, and legitimate cards can be acquired by illegitimate means. P, for example, had a legitimate ID card made using another woman’s birth certificate. When I met her last year in China, M had no valid identification. Without a legitimate ID card, M had no official status, which heavily restricted her options and forced further dependence upon her “husband”. It was dangerous for M to travel, particularly in the border regions, as she risked arrest and imprisonment by the authorities. But M and her child did not travel directly to the Vietnamese border. Instead, they stopped in an area some 50 kilometres (30 miles) north of the line. This had been M’s very first stop in China, almost four years ago. After being drugged and smuggled across the border, it was here that she had been purchased by a middle-aged Chinese Hmong couple, who kept her captive in their home. M was one of many teenaged Hmong girls held in the couple’s home, to be sold into forced marriages with Chinese men. Many of the men who came to see them were of the least marriageable sort: old, unattractive or disabled. Some of the men were 3 or 4 times older than the girls themselves. The terrified girls had little choice in the unions, being threatened with murder or sale into prostitution should they refuse. At times, traffickers do issue empty death threats. In other cases, it seems, uncooperative girls are indeed murdered. The girls are rumoured to have market value even after death, with their organs traded for medicinal purposes. M had held out against the death threats of the Chinese Hmong couple, until at last she lost all hope of ever returning home to her family. She was relatively fortunate in having been ultimately sold to a reasonably young and able-bodied man, who took her to his home in the north. Over the years, M and her “husband” had remained in touch with her Chinese Hmong traffickers, who had long promised to arrange for her a legitimate Chinese ID card. Her captors, ironically, were now to help M take back some measure of her freedom. When she arrived in southern China with her child, M returned to the home of the Chinese Hmong couple where she had once been held captive. I can only imagine M’s emotional turmoil as she stepped back in to the house that was once her prison. After more than three years, she met again with the man who had threatened to punish her disobedience with death. M had come to obtain a Chinese ID card – but this time, she was not willing to play by his rules. What M’s trafficker didn’t know is that the card she went there to obtain was his own. Stay tuned: subscribe here to receive all the news from The Human, Earth Project.